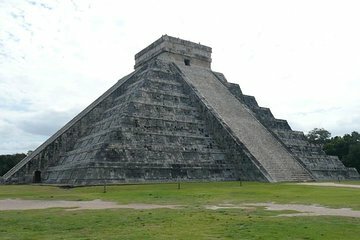 Nå två av Mexikos mest imponerande sevärdheter under denna actionfyllda, dubbeltidsbundna guidade turen, som tar dig till Chichen-Itza arkeologiska plats och Xcajum cenote. Koppla av och slå tillbaka för en all-inclusive-upplevelse, vilket gör det svårt att komma till varje plats. Njut av obegränsad dryck, luftkonditionering, en expertguide och en regional buffé lunch. Börja med ditt besök i de enorma forntida ruinerna med ett uppfriskande dopp i turkosvatten. The sights were wonderful. The tour was horrible. The bus was old with parts literally falling off. The A/C was not adequate, considering the temperatures outside. The tour operator was supposed to be ENCUENTRO T. It actually turned out to be Easy Tours. Their staff was rude and unhelpfull, more concerned with asking for tips than with our overall experience. This was even more evindent with someone they took on board the bus, supposedly to teach us some words in Mayan and to tell us about the culture. He spent more time and energy, trying to sell some handmade items. The food provided was of very poor quality and very limited options. The scenery is beautiful and our guide really took us through the history and architecture of chichen itza. I highly recommend swimming in the cenote and bringing a change of clothes. The downside was the endless stopover in tulum with souvenir hawkers all over. The colonial town square was great.